Evening primrose oil, comes from evening primrose or primula (Oenothera biennis and Oenothera lamarkiana), a plant native to North America, with medicinal and curative properties obtained through its seeds subjected to pressure in nutritional frio.___valor __Este oil, is very rich in polyunsaturated essential fatty acids: linoleic acid (70%) and gamma-linolenic acid (10%), both of the Omega 6 acids series, important precursors to various cellular mediators indispensable for the proper functioning and stability of the membranes of the cells of our organism, the development of the nervous system, the hormonal and regulation of coagulation processes. __Seran precursor of Eicosanoids (prostaglandins, thromboxanes, Leukotrienes and hydroxyacids), compounds that regulate several biological processes throughout our lives. Also contains oleic acid (monounsaturated fatty acid) in lesser proportion. essential, not fatty acids ___Los can be synthesized by our body, must be checked with the naturales___acido linoleic dieta.___Fuentes: are the vegetable oils such as sunflower, grape and Primrose as well as in dairy products, animal fats, seeds and fruits secos.___acido gamma-linolenic: is found in breast milk and oil of evening primrose and Borage. 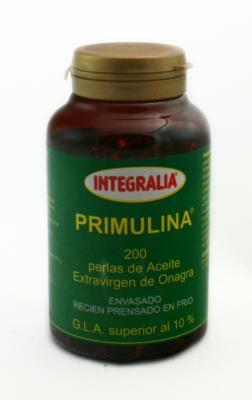 Ingredients: oil of evening primrose 500 mg; antioxidant vitamin e.